Paul Craig of Manistee, Michigan started his training with Deb Knight at the Conservatory of Dance and with Jefferson Baum at the Blue Lake Fine Arts Camp. He later attended Virginia School of the Arts under the direction of Petrus Bosman and Tyrone Brooks. He also attended Boston Ballet's Summer Dance Program, the summer program at the Virginia School of the Arts, and Kaatsbaan in Tivoli, New York. Craig joined Boston Ballet II for the 2007-2008 season and was promoted to the corps de ballet in 2008. 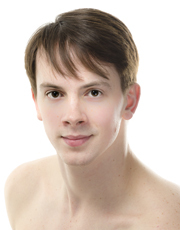 Craig has toured to Moscow, Russia with Boston Ballet II and was part of the International Exchange Program with Blue Lake Fine Arts Camp, touring to Germany, Italy, and France in 2002. He has performed as a guest in the World Ballet Competition Gala 2011 and 2012. His Boston Ballet classical repertory includes Rudolf Nureyev's Don Quixote, John Cranko'sRomeo and Juliet, Florence Clerc's La Bayadère, James Kudelka's Cinderella, and Mikko Nissinen's The Nutcracker, Swan Lake and The Sleeping Beauty. He has also had featured roles in Jerome Robbins' Fancy Free, Christopher Wheeldon's Polyphonia, George Balanchine's A Midsummer Night's Dream, Divertimento No. 15,TheFour Temperaments, Rubies, and Theme and Variations, Jiří Kylián's Bella Figura and Petite Mort, William Forsythe's The Second Detail, and Jorma Elo's In on Blue, Double Evil, Brake the Eyes, Slice to Sharp, and Carmen. Craig has taught master classes at the Conservatory of Dance in Manistee, at the Crooked Tree Arts Center in Petoskey, Michigan, and at Camp Harbor View, a nonprofit Boston outreach program.